Everyone loves their pets and their adorable antics, but what can be mutually agreed on by all pet owners is the hassle of the pet hair that is shed year-round in some cases. When you have hardwood floors, shed pet hair is more apparent than if you have carpet. Many vacuums don’t work very well on hardwood floors, but rather, are designed for carpet. Hardwood is more sensitive to damage than carpeting as well, so you have to choose your vacuum with this in mind. 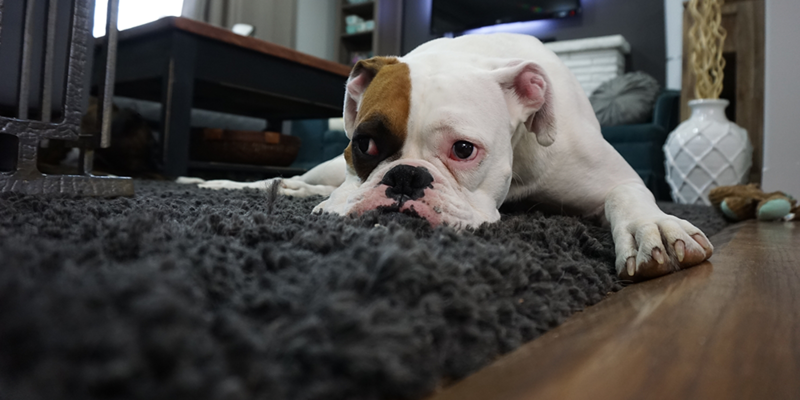 Being a pet-lovers ourselves, we put together this list that will outline which vacuums are best for pets and hardwood floors. We will talk about what to look for in a vacuum for this scenario, and how to choose the best one. The five models listed below are the best vacuums for pet hair and hardwood floors. Their features make them a great fit for homeowners who have one or multiple pets. This premium vacuum is known for its superior suction power. It won't get tangled in pet hair and won't lose suction. It is more expensive than most other vacuums on this list, but a good choice if you want the best of the best. Weighs under 20 lbs, includes a retractiable cord. Comes with a powered hand tool specifically designed to get pet hair off of upholstery. A good all-around option and a great mix of features and affordability. A different style than the others listed, the Roomba 650 is an autonomous robot vacuum that can handle anything you can throw at it, including pet hair. It can be programmed to run on a schedule and requires minimal maintenance. A durable, classic vacuum priced affordably. It is lightweight and can be used on hardwood and carpet. Has an automatic shut-off feature to prevent overheating if pet hair causes a clog. A lightweight, cordless vacuum that is great for cleaning up pet messes in small spaces. The battery makes it very versatile. You can clean anywhere, including your car, however the battery can die quickly, so you have to clean quickly. If you are in this situation, you have probably already figured out that not all vacuums are designed for this. When looking for a vacuum for pet hair in a home that is primarily hardwood, you need to consider the following things. Suction power: Pet hair can be tricker than dirt. It will accumulate quickly, and can often times get missed by some vacuums. You need a vacuum that has powerful suction and is explicitly designed with pet hair in mind, but is gentle enough to be used on hardwood floors. Gentle brushes: With hardwood, you have to be careful because most vacuums with rotating brushes will scratch your flooring. You should choose a vacuum that can turn of the brushes for use on hardwood, or have brushes soft enough that they won't damage your floors. Anti-tangle brushes: With pet hair, you have to worry about clogs and tangles. Many vacuums ignore anti-tangle designs to save money, but if you have a long hair pet, you need this. If you have short-hair animals, this isn't as big of a concern than with long hair. Five-year warranty for all parts. Super strong suction in the cleaner head, self-adjusts to get the deepest clean on hardwood floors. Has ball technology movement for easy handling during cleaning. Short hose extensions can be difficult for cleaning hard to reach areas. Too strong for thin rugs. Falls on the pricier side of the scale. Has issues staying upright while using the hose extension. The Dyson DC41 Animal Complete Upright Vacuum Cleaner is an extremely powerful model that can pick up just about anything with its industry-leading suction. It’s no match for hair, pet or human, and is able to handle large amounts at once without getting tangled or clogged. This model, designed by Dyson, utilizes its cyclone technology. This means that there is no need to buy expensive bags or filters and makes for easy emptying after sucking up the seasonal coat your dog just shed all over the living room floor. It also contains the fan favorite ball technology, which makes it easy to clean up the fur around the cat that decided to nap in the middle of the room as you begin vacuuming. It is great for all types of flooring including carpet, tile and hardwood floors. Like most Dyson models, the DC41 Animal Complete Upright Vacuum Cleaner comes with extra tools and attachments to help clean every surface and nook and cranny in the house. It also comes with a five-year warranty on all parts of the vacuum. A lightweight model that weighs under twenty pounds makes for easy lifting. Comes equipped with a twenty-five foot card, that is retractable. Comes on multiple color options. Contains an air powered hand tool that helps to remove pet hair from upholstery, carpets, and areas like stairs and corners of rooms. Short hose attachment can make cleaning a bit arduous and requires a lot of moving around and changing positions. Can be a hassle to empty without making a mess. The cord retracting feature is nice, but can get stuck and requires some help to wind up nicely. The Hoover T-Series WindTunnel Pet Rewind Bagless Upright Vacuum UH70210 is equipped with all the newest and greatest technology that the vacuum industry currently offers on the market today. This model from Hoover is designed with an upright bagless system to ensure minimal clogging, especially when it comes to pet hair, and to keep the suction strong during every use. The T-Series Windtunnel also comes with a plethora of useful features, including five levels of adjustable carpet cleaning, a suction only foot pedal, a handle that folds close to the vacuum to make storing it among all the dog toys easier. This vacuum also comes with a rubber grip hand held air powered extension to clean pet hair and other undesirable things off of furniture, stairs, pillows, whenever you need it. The Hoover T-Series WindTunnel has a twenty-five-foot cord, that rewinds itself back into the vacuum (which helps save time for extra games of fetch or belly rubs.) and also has an attached eight-inch stretchable hose, to help get hard to reach curves and corners. Has an advanced iAdapt sensor system to keep up with any changes in your homes layout. Easy start up, just have to press the CLEAN button and the Roomba goes. Can easily clean under furniture and can be used daily with ease. Works well and easily adjusts to clean all floor types. Can sometimes have a mind of its own, and can miss some rooms or spots repeatedly. Works best for light everyday cleaning. Not good for smaller spaces with lots of nooks, twists, and corners. Most likely the most popular and well-known vacuum on this list is the iRobot Roomba 650 Vacuum Cleaning Robot. Who hasn't seen the adorable videos of cats riding these around the house? While not just great for entertaining your cats, these tiny vacuums pack a big punch when it comes to keeping your hardwood floors clean. The iRobot Roomba 650 is the perfect vacuum for pet owners who want to keep their floors clean without daily sweeping since the Roomba runs on its own with a single press of a button. It uses sensors to maneuver around furniture and items to clean the whole house of stray pet hairs and dirt. It’s quiet and moves swiftly over all floor types, and is able to adjust to working on all floor types and has no problem switching from carpet, to hardwood, to linoleum, or even tile. Fondly referred to as the smartest vacuum on the market, this is a great investment for those short on time but heavy on pet hair. Works great when you need quick and easy cleaning of pet hair. Works perfectly on hardwood floors. Lightweight design for easy movement. It has an automatic shut off feature that prevents the vacuum from overheating. Makes a lot of noise during use. This is a budget-friendly option, so the construction/quality fits the price. Attachments can come off during use. The Eureka 3670G Mighty Mite Canister Vacuum puts a new spin on the typical vacuum model. A mixture between a Shop-Vac and a standard vacuum, this model from Eureka is a strong contender for all lightweight models. Weighing in at only ten pounds, this Eureka 3870G Mite Canister Vacuum is very portable and great for picking up pet hair from all areas in the home. This small model can also be used anywhere you bring your furry friends, from the boat, garage, camper, etc, anywhere that pets may shed and leave a small mess behind. Even though it is small in stature, this model is extremely powerful and works perfectly on hardwood floors and other hard surfaces to remove all pet hair, dirt, dust, and other debris. It has a twenty-foot cord which sadly, is not retractable, but the length makes cleaning easier and quicker since you don’t have to constantly look for a closer outlet as you move around. Another useful feature is this models auto shut off ability. We have all been there where we are mad about a pile of pet hair that just won’t budge, and next thing you know that all familiar smell of an overheating vacuum hits, but this Eureka model has an auto shut off feature to prevent that overheating from happening, and helps extend the life of your vacuum, saving you money in the long run. This vacuum has new cordless and bagless technology, which only involves a charged battery to function. Extremely easy and efficient to use for pet hair cleaning. Brushroll can be switched on and off to switch between carpet and hardwood floors. A battery does have to be charged for this Hoover model to function. The handle does have a tendency to come off during use but can be easily reattached. Does not fit under furniture very well. Hoover has been a well trusted and popular brand for years and its Linx Cordless Stick Vacuum BH50010 model stands up to that prestigious title. One of the first of its kind, the Linx Cordless Stick Vacuum is battery powered and bagless to make vacuuming pet hair easier, quicker, and less of a hassle for the pet owner. A lightweight but powerful machine, the Linx Cordless is no match for pet hair and easily adjusts from carpets to hardwood floors for pet owners who have to deal with hair on all kinds of surfaces. While it may be a bit too boxy to get under any low lying couches, the downsides of the vacuum and few and far between. Not only is it cordless, but it is also quieter, so it won't scare any pets in the process of cleaning up their mess. With no cord to worry about winding back up, it saves more time to cuddle with your furry buddy, and with its small frame, storage is no problem. This vacuum is extremely popular and while it may be a bit pricey, it is definitely worth the investment. None of these vacuums doing it for you? Check out our roundup post of the best vacuums of 2018 to see some more options for excellent vacuum cleaners. Learn More. We all love our pets, but cleaning up after them can be a never-ending chore. Which vacuum is the best fit for you and your furry friend? Let us know in the comments section below.